Each week the coaches at Boulder City High School nominate an athlete to spotlight for contributions made to his or her team. This week’s honoree is senior Tyler Campbell, who runs on the varsity cross-country team. Campbell placed first in the Sept. 14 Boulder City weekday meet against five other schools, with a time of 18:15, and 10th in the Las Vegas Invitational a few days before. He is a four-year varsity letter recipient in cross-country and also is on the school’s track team. He is the son of Jeni Campbell. Laura Hubel/Boulder City Review Each week the coaches at Boulder City High School nominate an athlete to spotlight for contributions made to his or her team. 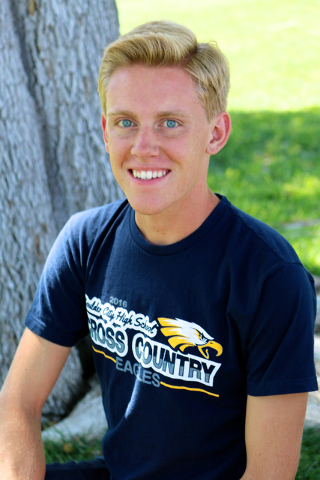 This week’s honoree is senior Tyler Campbell, who runs on the varsity cross-country team. Campbell placed first in the Sept. 14 Boulder City weekday meet against five other schools, with a time of 18:15, and 10th in the Las Vegas Invitational a few days before. He is a four-year varsity letter recipient in cross-country and also is on the school's track team. He is the son of Jeni Campbell.